Even on the chilly days of January, a much-anticipated sunny spot of the winter farmers market is peak citrus season. From Cara Cara oranges to Buddha’s Hand citron, a rainbow of locally grown, perfectly ripe citrus awaits you in varieties and flavors you can only find in the coldest months and can’t often find at the grocery store. Today’s citrus varieties are believe to have descended from just a handful of ancestors primarily in Asia. Citrus trees first reached America in the 1500s, but were not grown widely in California until an ample supply of irrigation water was channeled to the Central Valley. Today, California leads the country in fresh citrus production. Here are some of citrus varieties you’ll find at our farmers markets to brighten your days and help you get your dose of vitamin C in the winter months. Click on the links below for more about specific varieties, growers, and recipes. Oranges: Oranges are thought to be a hybrid of pomelos and mandarins. Most oranges, such as the navel orange (with its distinctive “belly button” on the blossom end), are seasonally available late fall through early spring. Cara Cara is a rich and sweet variety of navel orange with salmon-colored flesh. Blood oranges (shown above) have a deep red color, which is due to the presence of anthocynanins, plant pigments that have antioxidant properties. Valencia oranges, the seeded variety that is popular for juicing, are generally available May through September, when other varieties are out of season at the farmers market. Some varieties, like the navel, are generally easy to peel by hand, while others are best cut with a knife. Mandarins: Certain varieties of mandarins are marketed as tangerines, but many people consider the two names synonymous. Satsuma mandarins have loose, leathery skin, while Clementines have thinner, tighter skin and few seeds. Pages are often called mandarins, but are actually a cross between a tangelo (a mandarin-grapefruit hybrid) and a Clementine. Kishus (shown above) are tiny, sweet, seedless mandarins (perfect for kids!). Canned mandarins are usually bathed in lye after they are peeled to remove their membranes—a good reason to buy them fresh at the farmers market. Citrons: Citron is a citrus fruit that resembles a lumpy lemon. Unlike lemons and oranges, however, citron is used primarily for its zest, since its pulp is dry and contains little juice. It is prized for the essential oils in the outer rind (flavedo), which are especially fragrant and believed to have antibiotic properties, as well as its pith (albedo), which is often candied and used in baking, particularly around the winter holidays. Another popular use is infused vodka. The pulp-less, many-tentacled Buddha’s Hand citron is almost all peel, with a pith that is not bitter, unlike most citrus fruits. Limes: Limes have thin green (sometimes yellow) rinds and green flesh. Lime juice and zest are widely used in cooking and beverages. The citrus can be used for both its savory and sweet properties and is used in a variety of cuisines. The common “bartender’s lime,” or Bearss lime, may be a hybrid of the Key lime and citron. Sweet limes (aka Palestine limes) resemble lemons and are less acidic. The lumpy Makrut lime is has aromatic leaves that are popular in Southeast Asian cuisine, with juice and rind that are used medicinally. Lemons: For thousands of years, lemons have been widely used medicinally and as an antiseptic. Lemon juice prevents oxidation of foods that brown after being peeled or sliced, such as apples, avocados, and bananas. A true lemon, Eureka is the most common variety. Meyer lemons are likely a hybrid of lemon and orange. They have a thinner skin and sweet-tart flesh, and are more perishable than other lemon varieties. Variegated lemons (shown above) have green and yellow stripes, pink flesh, and a tangy flavor. Grapefruit: Large with whitish or pink pulp, grapefruits are the result of a natural cross between sweet orange and pomelo. Pink varieties, like Red Ruby or Rio Red, contain the pigment lycopene and are especially good for juicing. Besides the sour flavor in all citrus fruits (the result of citric acid), they contain a flavonoid, called naringin, that gives them a bitter flavor. 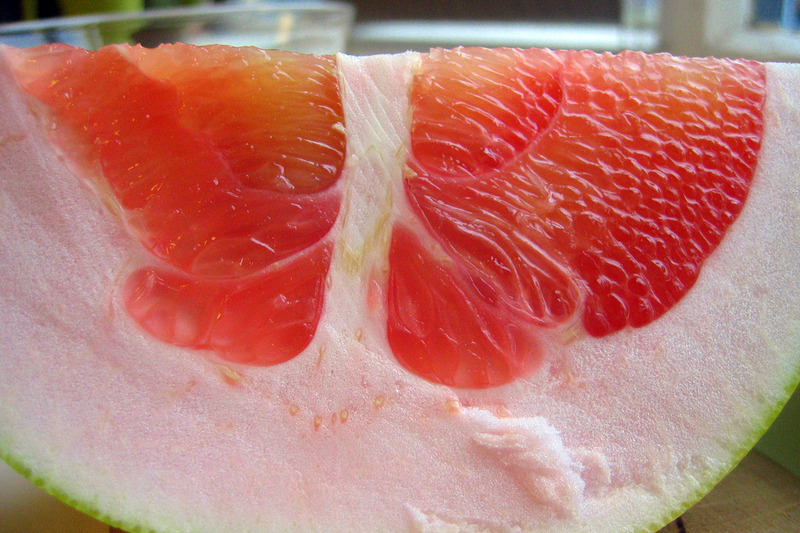 Narigin and other organic compounds in grapefruits can also interact with certain drugs in the human body. Though sometimes called grapefruits, Oro Blancos and Cocktail “grapefruits” are crosses between a pomelo and a mandarin. Kumquats: The perfect winter sweet snack, kumquats are shaped like tiny oranges, which can be gobbled whole—skin, seeds, and all. They have very sour flesh, but their rinds are sweet. Meiwa kumquats are more round, while the Nagami is ovoid. The fruit is also often candied or preserved in salt or sugar. Some mixologists are even swapping kumquats for olives for a more modern twist on the martini. Find farmers who have citrus fruits at the Ferry Plaza Farmers Market and Jack London Square Farmers Markets here.